The Independent is putting together a special calendar of holiday events in the East Mountains and Estancia Valley for next week’s issue. Do you have a crafts show, concert, or other event you want the public to know about? Send it here! These listings are free and the more the merrier! 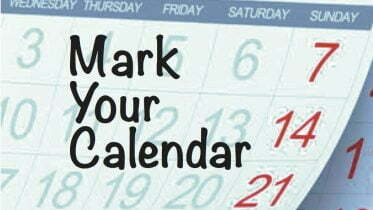 Edgewood town council meets NOVEMBER 15 and first and third Wednesdays at 6:30 p.m. at the Edgewood Community Center. For info call 505-286-4518. Third Thursday Edgewood Chamber of Commerce meeting, NOVEMBER 16 from 11:45-12:45 p.m. at Sandia Labs Federal Credit Union in Edgewood. For info call 505-596-0566. 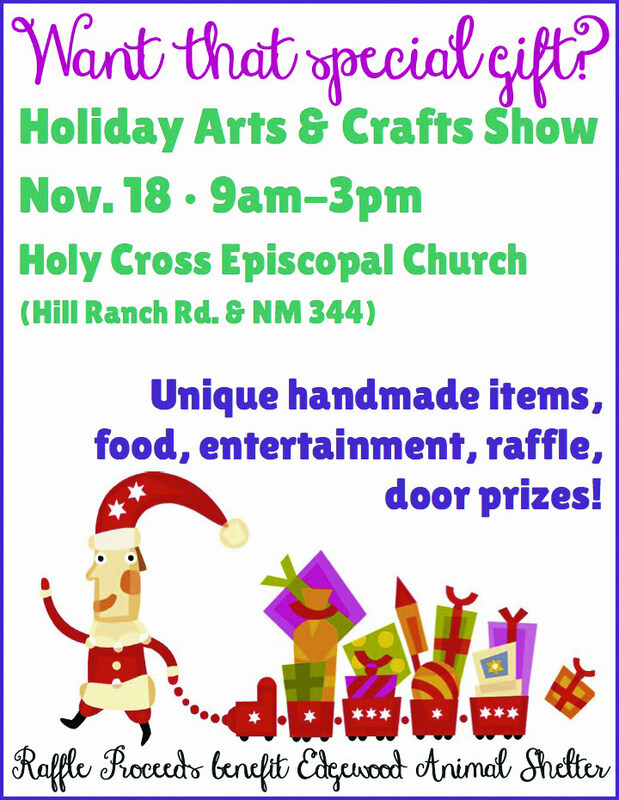 Holiday craft fair NOVEMBER 18 at Holy Cross Church in Edgewood. 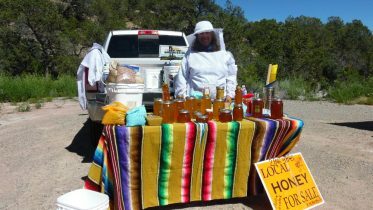 For info, holycrossnmcraftfair@aol.com or 505-850-9720. Handmade crafts, entertainment, raffle and door prizes and food by Our Daily Bread food truck. Raffle proceeds benefit the Edgewood Animal Shelter. Abó Dark Sky Event, NOVEMBER 17 from 6 to 10 p.m. at Salinas Pueblo Missions National Monument, 9 miles west of Mountainair on U.S. 60. Dark sky photography and beautiful night sky viewing. Design, create and play during the Edgewood Library’s pop-up playground days, NOVEMBER 18, from 10:30 a.m. to 2:30 p.m. What can you do with cardboard, tape, and your imagination? For info call 505-281-0138. Free and open to all ages. Cheese & Wine Holiday Affair, NOVEMBER 18 from noon to 5 p.m. at Old Windmill Dairy in Estancia. Wine and cheese sampling, carnival games, face painting. More info at oldwindmilldairy.com. Prescription drug take-back day, NOVEMBER 18 in Estancia, sponsored by the Estancia Police Department and the Partnership for a Healthy Torrance County. Plus a wellness walk at 12 p.m. at Arthur Park in Estancia. Village of Tijeras council meeting 6 p.m. on NOVEMBER 20 in the village chambers. For info call 505-281-1220. The Estancia town board of trustees meets at town hall NOVEMBER 20 and first and third Mondays at 6:15 p.m. For info call 505-384-2709. Mountainair town council meetings, first and third Tuesdays of the month and NOVEMBER 21 at 5 p.m. in the council meeting room. For info call 505-847-2321. Town of Edgewood’s parks and recreation advisory committee meets, NOVEMBER 21 at 6:30 p.m. at the town office. For info contact Roger Holden at 505-286-4518 or rholden@edgewood-nm.gov. A blood drive will be held at the Estancia Library on NOVEMBER 22 from 2 to 6 p.m., a way to empower the community after tragic events in Las Vegas. For info, contact Angela at 505-384-9655. The Torrance County Commission meets NOVEMBER 22 and second and fourth Wednesdays at 9 a.m. at the county building in Estancia. For information, call 505-544-4700. Come be family at Chili Hills NOVEMBER 23 for a free Thanksgiving Dinner with all the trimmings, from 4-8 p.m. at the Edgewood restaurant. Sponsor a table or volunteer. Contact Chili Hills for details. Locations are needed for Small Business Saturday for a holiday scavenger hunt on NOVEMBER 25. To get involved contact Linda at 505-596-0566. 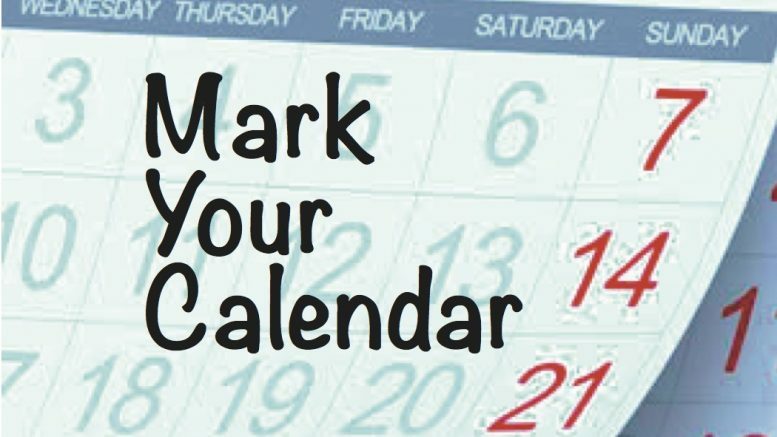 Moriarty City Council meets at the Moriarty Civic Center NOVEMBER 28 (Thanksgiving schedule date) and second and fourth Wednesdays at 7:30 p.m. For info call 505-832-4406. Spaghetti Dinner & Ice Cream Bar fundraiser for Torrance County Sheriff’s Deputy Ron Fulfer, DECEMBER 1 at the Moriarty Civic Center from 6 to 11 p.m. In addition to dinner, the event includes two raffles, a silent auction and a bake sale. Tickets are $7 for adults and $3 for kids under 12. For info search for the event on Facebook. Winter Arts Festival by the Route 66 Arts Alliance, DECEMBER 2 at Edgewood Elementary School from 9 a.m. to 4 p.m. Free admission, local musicians, artists and writers, food. For info visit route66artsalliance.org. “Music for the Soul” concert series presents composer and pianist Grisha Krivchenia at Holy Cross Episcopal Church in Edgewood. A reception starts at 2:30 p.m. on DECEMBER 3, with the performance starting at 3 p.m. The performance is free but donations help support the series. For info contact jnoyer15@gmail.com. Medicare Open Enrollment assistance from NM Aging and Long-Term Services, providing free, unbiased advice, DECEMBER 4 from 9 a.m. to 1 p.m. at Tijeras Senior Center. No appointment needed, call 505-383-3919 for info. Medicare Open Enrollment assistance from NM Aging and Long-Term Services, providing free, unbiased advice, DECEMBER 5 from 8:30 to 11 a.m. at Bethel Storehouse in Moriarty. No appointment needed, call 505-383-3919 for info.